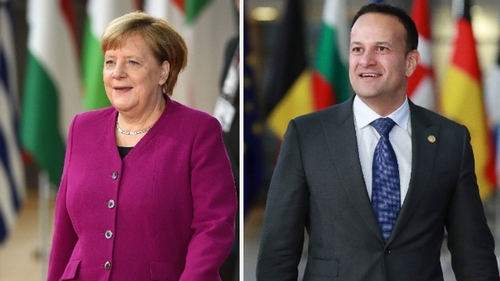 A Government source has said Taoiseach Leo Varadkar has held a number of conversations with German Chancellor Angela Merkel in the past 24 hours, and she had "unequivocally" reaffirmed her support for Ireland. "In each of these conversations she has offered full solidarity with Ireland," the source said. "She said that any solution to the backstop has to satisfy the requirements laid down by the [EU] Task Force and Ireland. "Angela Merkel is on the record as saying we need an answer from the British government on how to break the deadlock. "Ireland welcomes that acknowledgement from the Chancellor as to how the British are going to need to find a solution." The remarks follow a report in the Financial Times, quoting three diplomatic sources, that during the dinner of European Union leaders in Brussels on Wednesday night, Chancellor Merkel had "indicated that the EU and the Republic of Ireland should rethink their approach on Northern Ireland to avoid a fundamental clash with London". The paper also reported her comments during yesterday’s post-summit news conference, in which she said: "We all need to find an answer on Ireland and Northern Ireland. If you don’t have an agreement you don’t have a satisfactory answer [to the border issue] either." This morning, the London Times reported that France and Germany had "instructed Michel Barnier to be 'more flexible' with Theresa May in a final push to solve the Irish border question". The paper, quoting "senior diplomats", said that "in a private session of European leaders on Wednesday night, Angela Merkel and President Macron urged Mr Barnier, the EU’s chief negotiator, to give the prime minister legal guarantees that a deal with Europe will never impose a customs border in the Irish Sea". EU leaders are currently attending the ASEM summit in Brussels, which brings together EU and Asian countries. The Government source said the Taoiseach spoke to Mrs Merkel both yesterday, during day two of the EU summit, and last night, during a dinner for EU and Asian leaders. It comes as EU chief Brexit negotiator Michel Barnier said a Brexit deal with the UK was 90% done, although there was still a chance no accord would be reached due to ongoing stumbling blocks over the Irish border. "90% of the accord on the table has been agreed with Britain," Mr Barnier told France Inter radio. "I'm convinced a deal is necessary, I'm still not sure we'll get one," he said. Mr Barnier said that problems over Ireland could lead to the failure of Brexit talks. Mr Barnier said that a Brexit accord was "possible but difficult", adding he was still not certain if a deal could be reached. He said that the EU does not want to impose a hard Brexit and there was absolutely no intention by European leaders to punish Britain. Yesterday, British Prime Minister Theresa May and other EU leaders voiced renewed confidence that they could secure a Brexit deal, yet the two sides remain at odds over how to deal with their only land border, between Northern Ireland and the Republic of Ireland. Mrs May had also signalled she would consider extending the transition period "for a matter of months" after Britain leaves the EU in March. EU leaders warned Britain they would offer no more concessions to break the deadlock in negotiations, but expressed confidence that a deal can be done before the country leaves the EU next March. Yesterday's summit in Brussels wrapped up without progress after Mrs May offered no new proposals, beyond suggesting she could accept a longer transition period after Brexit. Mrs May has been struggling since the 2016 referendum vote to leave the EU to reconcile the demands of her eurosceptic Conservative party with the realities of negotiating with Brussels. Her difficulties were laid bare by the fury sparked in the UK at her suggestion that she could extend a post-Brexit transition period to address the Irish border issue. Both sides have agreed there should be a legally-binding backstop arrangement to avoid frontier checks if and until a new trade deal solves the issue. This would come into effect after the transition ends, but both sides strongly disagree on its terms, and the issue is holding up the rest of the Brexit talks. Meanwhile, and number of Unionists politicians have criticised yesterday’s comments by the Taoiseach on a return to violence if a hard border emerged after Brexit. DUP MP Sammy Wilson said Mr Varadkar's behaviour was "despicable, low and rotten", claiming he was scraping the bottom of a "very deep barrel of threats, deception and rhetoric". His party colleague Gregory Campbell described the comments as "completely outrageous and over-the-top". Speaking on RTÉ’s Today with Sean O'Rourke programme, Mr Campbell said there has been no evidence whatsoever that violence is on the increase. He said nobody should get complacent but "to suggest that non-existent customs checkpoints were going to be the subject of attack, there is not going to be any checkpoints. How could someone attack something that isn't there? He added: "It's unfortunately the Taoiseach is once again going over the top in trying to make a point. I think it was totally unhelpful and totally counterproductive". In response, Fine Gael Brexit spokesman Senator Neale Richmond denied it was scaremongering and said the Taoiseach was repeating the expert opinion of the Chief Constable of the PSNI, the Deputy Commissioner of An Garda Síochána, former Senator George Mitchell and others involved in the peace process. Mr Richmond also said if it goes down to WTO rules there simply had to be customs checkpoints.